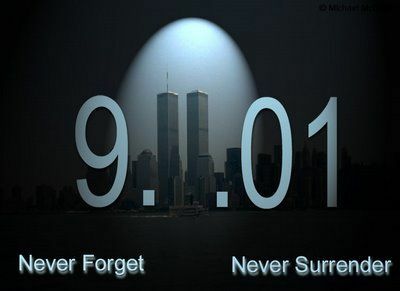 Today marks the 13th anniversary of that dark day, when Islamic jihadis killed 2,996 of our friends, neighbors, and loved ones. Two years ago, the USA Today is wondered if 9/11 is becoming just another day, similar to Pearl Harbor Day. Based on the tiny coverage by major news outlets, which feature tiny stories on their front pages, if at all, it just might be. NY Times, the “paper of record”? Nothing. The Washington Post? Nothing. CBS has an article wondering if we’re any safer. NBC? Nothing. ABC has a brief story about changes to the commemoration. Good for them. LA Times? They actually do a good job, with 8 articles for a look back, including 9/11 in pictures. CNN has a few tiny graphics. Good for the Daily Kos, about the only liberal blog that mentions 9/11 that I’ve run across. This entry was written by William Teach and posted on at 8:30 am and filed under 2996. Bookmark the permalink. Follow any comments here with the RSS feed for this post. Thank you for your post and for so kindly linking to my thoughts on this day. We are united in sorrow and strengthened by our love of liberty. God bless America. NEVER FORGET. Thank you, Teach. And thanks for keeping the “Never Forget” pic in the sidebar. I will never forget watching the events on a 13″ B&W TV in the plant that someone had rigged up, and hearing the exploding noises, and finally figuring out what they were.